Happy New Year! Hopefully this will be a good year for all of you. Also pray for me so that I can give you my best. Today I'm not going to give you any computer/ blogging/ SEO tips. This is all about happy new year. I would like to wish you all. Now I will share a small file. 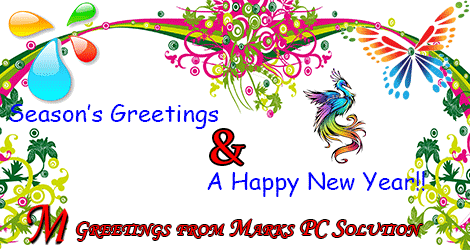 Basically it is an e card made by adobe flash. You can share this with your dearest and nearest people. Download the file from the link above. It is a zipped folder (Less than 450 KB). Unzip it first. Then click twice on it. You may need flash player. So make sure it is installed on your PC. When you double click on the .exe file it will open in a window. Now click on the box to open it. Then click on the cake to wish. Now click on the bush at the bottom left corner. Then click on the little start from the bottom right corner. Click on the tree from the right. Happy New Year! Welcome 2015. Share this post with your friends. Wish them. Forget the bad experiences of previous years. Try to make 2015 a memorable one! Best of luck. Thank you Mr. Rahman. Happy new your. 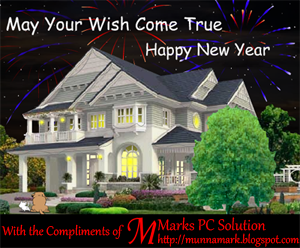 New year might be the year of new inventions for the audience of Marks Pc Solution! Thanks for the comment Mostak. I will try my best . . .